Yup. The other day (well a few weeks ago actually, before I came down with this horrible lurgy) I came home from a tough day at the office and had a delightful meal on the table for me. How quaint! 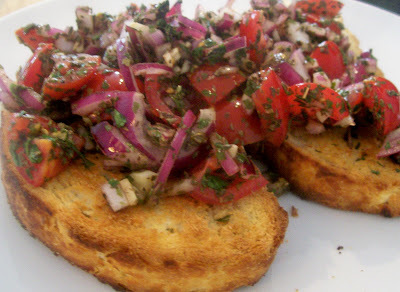 The first course was this tomato and onion bruschetta. I properly love bruschetta. I know that's probably damaging my Scottish person street cred, but I do. This was the main course. 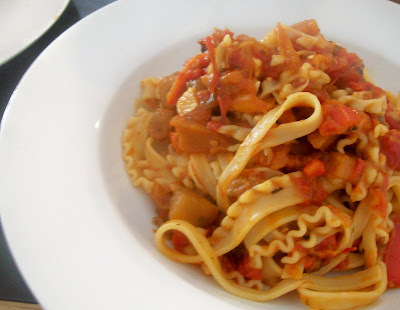 It's tripoline pasta which is kinda like frilly linguine with tomatoes, aubergines, and roasted peppers. What a lovely thing to come home to on a Friday evening. That and a glass of wine and I'm good to go. Lucky you! That pasta looks delicious - and two courses, too, fancy! Mmm... That looks VERY good! And I'm going to make that Millionaire's shortbread! I really am! Speaking of users, the Zune Social is also great fun, letting you find others with shared tastes and becoming friends with them. This is a very nice post..
That pasta looks good. 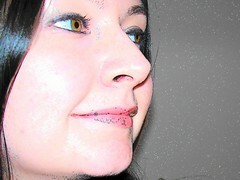 Will bookmark your blog.